I liked the naming style… THE General, THE Hickory and so on (so I borrowed the idea for this entire blog post), but found the label to be a little distracting. I found it to be a bit on the “I did this myself with photoshop and my own printer” kinda feel… And I’m no graphic designer but I know a couple things I’ve picked up along the way. Using more than one font on a label is usually OK – using 6 fonts all on the front of the bottle – well, it looks a little discombobulated. It’s hard for me to explain what should be done but there’s probably some simplification that would better allow the text to pop off the bottle. 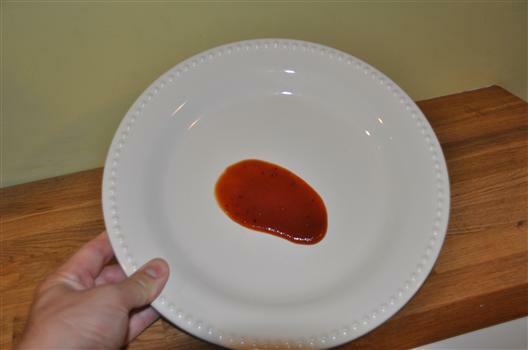 But no matter, it’s what’s inside that counts for the most part on BBQ Sauce Reviews. 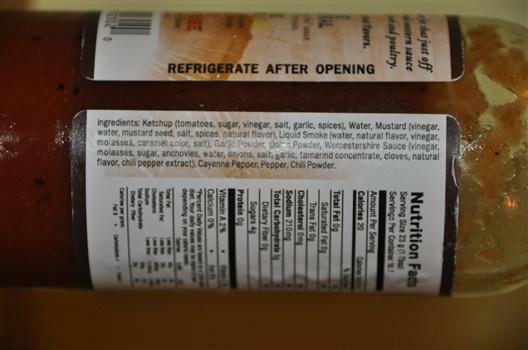 The only reason I’d mark against a sauce related to label is if it’s really unprofessional or if it’s deceptive about what is inside the sauce. And in this case, the sauce tastes deceptively good, so the label is cool! It could be missing a few key callouts (no HFCS, no preservatives, and low sodium in comparison to some other sauces in this category), but no matter – understatement is always better than overstatement. The taste of the sauce makes up for any appearance the label might not otherwise suggest. It has a very smoky, oniony flavor with a salty, sweet finish. In fact, one taste is almost guaranteed to give you bad breath – in other words, it’s great! Perfect on chicken or ribs, this sauce has just the right smidge of heat to dazzle your tastebuds. I will be reviewing these flavors over time… It is a little bit difficult reading these other flavors (yellow on white is a tough one). not the best pic but it will do. No HFCS, and no bad additives. Good specks and natural appearance. looking for a new smoky, salty, sweet sauce – give this stuff a shot. Once I opened the bottle, I found myself going back to it over and over again. Sounds yummy. Looking forward to the other reviews. I like the label. A boy, his dog and his barbeque. Not too bad. The Hickory is a great overall sauce. I’m not a fan of the super sweet sauces, so I love it! Just got my sample pack in the mail- EXCELLENT sauce. I can’t decided which I like better, The Hickory or The Firehouse, 2 comp. different tastes!